While I have 5 marathons under my belt, this would be the first that I’ve run in more than nine years. Throughout the past nine years I’ve been running off and on, and not until the past one or two years have I finally start to take running more seriously. Prior to starting the 18 week training plan, I battled with runner’s knee (Patellofemoral pain syndrome). Through physical therapy exercises, I strengthened my hips, quads and core, but what I believe contributed most to alleviating my knee pain was a change to my stride shifting from a heel strike to a midfoot strike. I followed Hal Higdon’s 18 week Intermediate training plan. Within a given a week, I swapped some days around occasionally, but only skipped one or two runs throughout the entire cycle. For cross-training, I mostly did weight training including the PT exercises I learned while I was struggling with knee issues. Towards the end of the training plan, after the 20 milers, I opted for yoga on cross-training days and skipped or reduced the weight training sets. I ended up switching hotels a week before the after race after learning that the hotel I originally booked was not included in the race’s hotel shuttle program. I was able to find a room at a hotel less than a half mile from the race which ended up working out really well. I woke up at 5am for a 7am start. I was able to take my time having breakfast and getting ready, and headed over to the start line at 6:30am. When I arrived at the start, I was surprised to find that no one had lined up yet, and it wasn’t until about 6:50am that they called the runners to line up. In previous years they would start both the marathoners and half-marathoners at the same time, while this year they started the half-marathoners an hour later. Also, this year’s race had about half as many participants as when I had last run in 2009, so I was surprised at how few runners there were, and how close to the starting line I was able to get. When I originally signed up, I entered a target per-mile pace of between 7:45 and 8:00 on my registration form. This put me in corrall A, and I would be one of the first runners to cross the start line. Being one of the first runners out of the gate, I knew I would be tempted to keep pace with the faster runner’s also up front. Having come out of the gate too fast in a previous race, I knew I couldn’t make the same mistake during this race. At the same time, getting passed by other runners isn’t a good feeling, especially in just the first moments of my first competitive race in several years. Miles 1-5 - I spent the first miles trying to decide on the right pace. My goal pace was 7:45/mi and before the race I told myself that I needed to start at that pace, and if it felt fast, settle at 8:00/mi. I ended up around a 7:25/mi and it just felt like a pace that I could keep up forever. Miles 6-8 - Finding myself at even stride with the 3:15 pacers, I worried that I was going too fast. I slowed my pace down a few times to let them go, only to find myself catching back up to them when I stopped concentrating on how fast I was running. At some point during mile 8, as I was running alongside one of the two 3:15 pace coaches, I looked behind me and realized that the rest of the 3:15ers were behind me. I looked at my watch and realized I was now running at about a 7:15 clip and the pace coach I was running with had run ahead perhaps to take a bathroom break. Miles 9-20 - These miles went by uneventfully. I felt comfortable, though still concerned I might burn out. As I approached mile 20 I knew I was gonna crush my goal, it wasn’t going be fun, but I didn’t come all this way to fade out at mile 20. Miles 20-24 - These miles were hellish, but I did my best to think positively. I felt sharp pain in the outside of my right foot (5th metatarsal) and as a result regressed back to my heel striking gait. Miles 25-Finish - The highlight of the Green Bay Marathon is that the last mile includes a lap inside Lambeau Field. 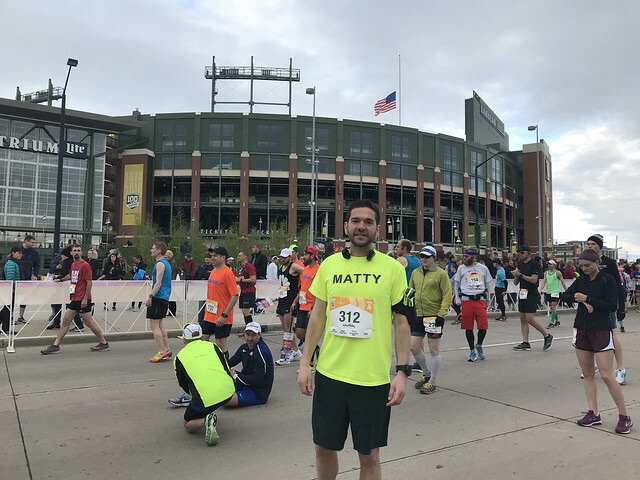 As I approached Lambeau, there wasn’t a single runner within a quarter mile of me so I envisioned running through Lambeau with a dedicated ovation from the marathon supporters in the stadium. What I didn’t realize is that before this iconic stretch, the Marathon and Half Marathon courses converge and I found myself in a giant pack of 10:00/mi paced half marathoners. More than anything, I was nervous that I had maybe gone off course and wanted to make sure I was still going the right way. To my relief, I spotted another yellow bib in the sea of orange ones, and closed the race in a rather anticlimactic way, crossing the finish line mostly with racers that had only run half as far as I had. In software development, following each two week cycle of work, the team meets for what’s called an “agile retrospective”, brainstorming ideas into three categories: “Start” -> things which should be tried next time. “Stop” -> behaviors or practices done during this cycle that should not be done during the next. “Continue” -> behaviors or practices that worked well and should be continued next time. In that spirit, here are some retrospective notes for this training cycle and race. *Increase mileage and intensity without getting injured. This is easier said than done, but this is the name of the game for improvement. *Try a new training plan (more speed/hill work, more miles). In my opinion the various marathon training plans are more similar than they are different and follow a basic set of principles (easy day/hard day, V02 max/lactate threshold runs, rest days, long runs, etc). With that said, I have been pretty loyal to Hal Higdon and branching out could help me find a plan that can shave some minutes off of my time. *Losing a few lbs. At a 23 BMI (5'10" 160lbs), losing a few pounds would reduce risk of injury and improve my pace. *Following the plan to a T. There were a handful of days where I was achy and should have opted for taking the day off instead of feeling the need to follow the plan religiously. *Training without understanding the purpose of each run. 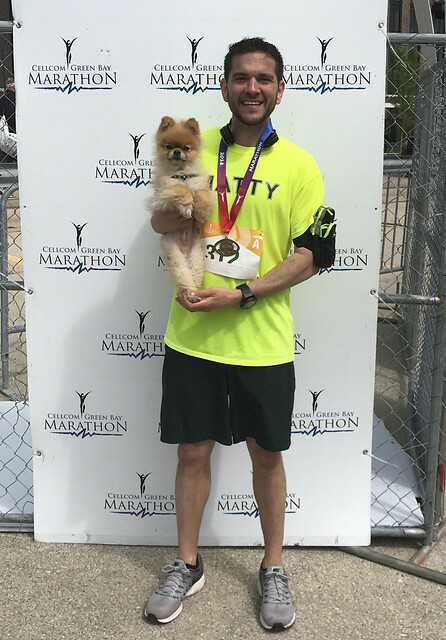 I just started reading "Advanced Marathoning" by Pfitzinger/Douglas and even though I didn�t follow a "Pfitz" plan during this training cycle, understanding the purpose of each run has been profound, and hopefully something I can use to my advantage next time. *Alternating different models of running shoes. *Bring lots of gels. I ended up eating about 7 gels during the race, 4 or 5 of which were caffeinated. *Follow a training plan. While it is good to understand the purpose of each type of run during training to allow customization, it is equally important to follow a plan, taking the need to think about how many miles to run each day out of the equation. *Enjoying the easy days. I have really enjoyed training for and running this race but at the end of the day it is important to remind myself that this is for fun. Balancing the tough timed training days with easy days is key to maintaining the dedication i've put towards running. Your work is good. I want more information about harrington jackets this topic. Can you provide a good documentation on this topic. For document format you can go through . It is one of the cheapest writing service. I could prepare for both events at the same point. So I bit the shot and signed up for the whole competition! I guess I had a small heart strike that day university assignment help I hit submit on my enrollment. Thankfully, I had a gathering of friends that I understood would be there to support me get into the practice!